RevHD, manufacturers of the hammer-installed wheel seal, have produced a new line of severe duty hub caps that can alert you if your wheel end reaches temperatures above 250° F. “We are calling it a ‘severe duty’ hub cap because, like our wheel seals, all the engineering and design for this hub cap was focused on off-road and extreme hauling conditions. The hub cap features spokes across the lens and utilizes thicker material for a more solid build.” said Brian Beathard, National Sales Manager for RevHD, LLC. In addition, every box comes with a FREE TempBolt™ - a heat check indicator that extends if the wheel end temperature reaches 250° F or higher. This indicates the potential for heat damage to the bearings, hub, or spindle. “Everything about this hub cap is designed to help keep the wheel end safe.” said Beathard. 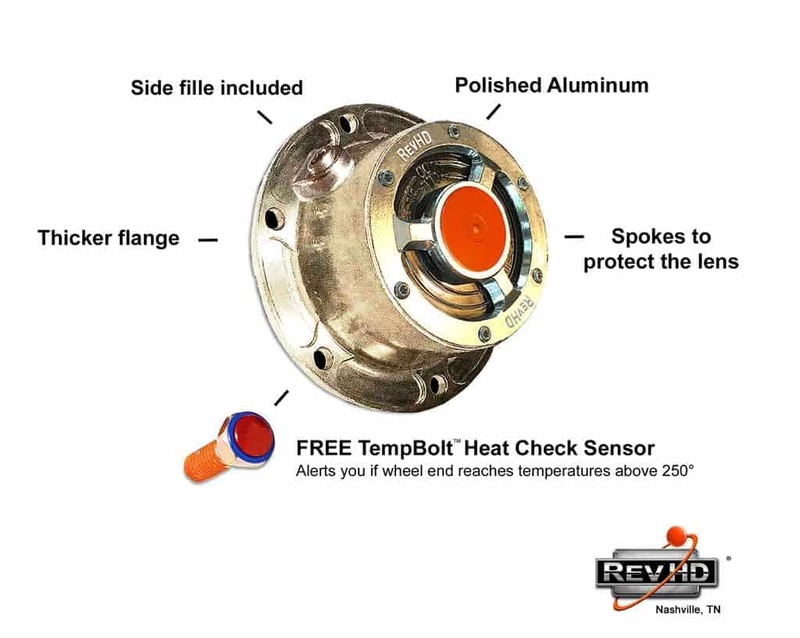 “The included TempBolt™ offers a solution for those wanting to know if their wheel ends need to be checked for heat scorching and other heat related issues.” RevHD offers their hub cap in a standard 6-hole, TN trailer version; and in a PSI version for now. Later in the year, they plan to produce a steer version and a TP trailer version of the hub cap. RevHD also offers the only no-questions-asked warranty. And, if the shop technicians take their Free online training course, their warranty includes the brakes. The new RevHD hub cap is made of polished aluminum and includes the gasket and bolts in every box. RevHD sells through qualified distributors in the United States and Canada. For more information, call 844-REV-SEAL or visit www.RevHD.com.